Free cancellation can be made up until 30 days before the check-in day. For cancellations made after this time a cancellation fee of no penalty will be charged. All times refer to the local time at the property. For no-show, 100% of the entire stay will be charged. 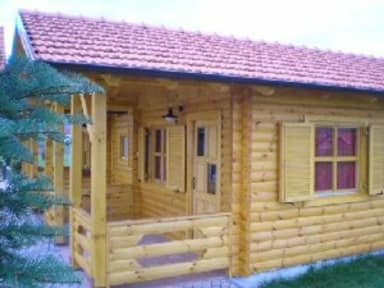 Property House Tina is situated in a small village Grabovac, near Plitvice Lakes National Park, a Unesco World Heritage Site. House Tina is newly decorated and has 8 rooms categorized 3 stars. The location is a quiet one, the house has a spacious garden all around, with tables and benches for about thirty people. There is also enough space to park ten cars. In the house we serve buffet breakfast; all the foods are products of Croatia: marmalade, butter, cheese, ham, honey, eggs (soft boiled, hard boiled, scrambled), corn flakes, two types of bread and toast. The following beverages are served for breakfast: coffee, tea, milk, hot chocolate, orange juice in unlimited quantities. Breakfast is served inside the house, in our dining room, as well as on the patio. The village Grabovac is only 8 km away from the National Park Plitvice Lakes, a Unesco World Heritage Site. The visiting area of the National Park has 16 beautiful lakes, all connected to each other with numerous beautiful waterfalls. The lakes are on different levels, and the waterfalls are cascading between them over travertine barriers. Travertine is a unique kind of rock which is not eroded by water; on the contrary, water makes it grow and change its shape; so every visit to the lakes offers a new memorable experience. On and around the lakes grow many different kinds of plants, suchs as more than 20 different types of orchyds. The animal life is also rich. Large animals can not be met while walking around the lakes, but you can enjoy watching beautiful butterflies, frogs, salamanders, squirrels. The lakes are visited on foot, visitors walk along footpaths and wooden bridges. There are electric boats on the biggest lake. Other activities and places of interest in the area are Barac's caves, Rastoke waterfalls, white water rafting and horseback riding, several excellent restaurants, swimming on the River Korana.